Tonight we bring you another excellent tweet-by-tweet review from our guest film critic Tim Schilling! I’m sure by now you guys are familiar with the concept: We take a movie and give you a running commentary through twitter. After the film is done, we will post the review over here at Slasher Studios. 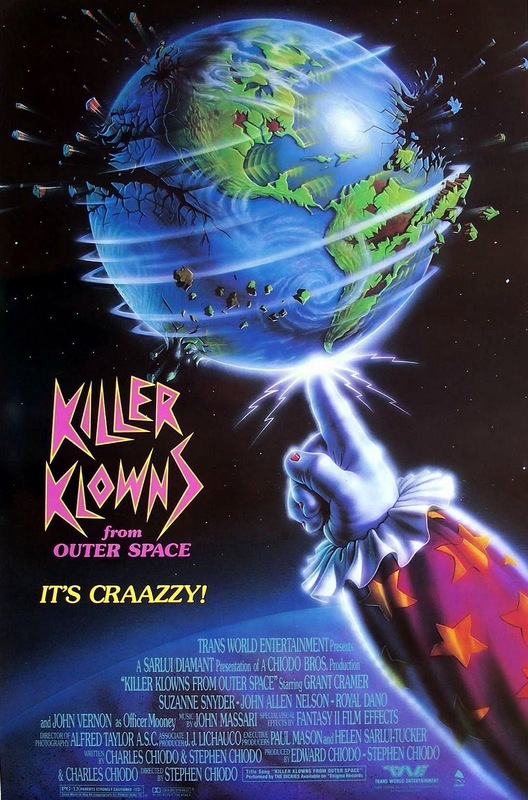 Tonight Tim takes a look at the vastly underrated comedy-horror epic “Killer Klowns from Outer Space.” Just remember, in space no one can eat ice cream…. 80’s comedy horror, one of my favorite sub genres. I haven’t seen this movie in at least a billion years, and it scared the crap outta me back then. 0:02 Perfect 80’s music, check. 0:05 Cheesy 80’s special effects, check! 0:18 Popcorn guns are terrifying. 0:22 This movie would have been perfect in 3D. [that may be the only time I’ll ever say that]. 0:26 The sounds that these clowns make are gonna give me nightmares. Hopefully? 0:37 If I ever call the cops cause clowns are attacking they better believe me. 0:41 …Alien popcorn that sounds like birds and then eats people. 0:43 Why do I think those shadow puppets are gonna eat/kill these people? 0:44 I wuz right, but does that mean the popcorn is people…? 0:48 Obviously this cop shoulda gone to college himself instead of complaining about all the kids. 0:51 Does this movie remind anyone else of Beetlejuice? There are a lot of similarities I think. 0:52 So far, it’s a great movie! I haven’t finished watching it but I would still recommend it. #KillerKlownsFromOuterSpace is another example that the 80’s were the best decade of film. From the great music to the cheesy special effects to the corny acting & one liners, #KillerKlownsFromOuterSpace is a perfect horror-comedy.